Check Out My Recent Discoveries! 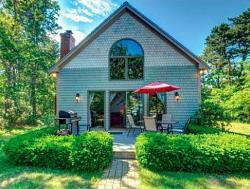 For anyone who's waited 'til the last minute to find the perfect vacation rental for your getaway to Cape Cod, this page is for you! Vacancies usually don't last long once they're publicized. So I can't and don't guarantee availability at any time. Close to bike trail, Nauset Light and Coast Guard Beach. Secluded setting but convenient to everything. Limited availability in August 2018. See current availability, more photos and details about this rental.